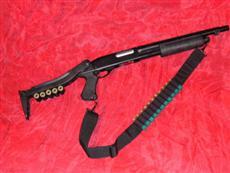 Folding stock: I think the first thing one notices when looking at the M870 Grip Version is the folding stock. 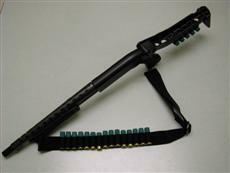 The folding stock I used was the Advanced Research Universal topfolding stock, which is meant to be used on a variety of real shotguns. Now, I think the Grip version has a mount on the grip to fit the Maruzen folding stock, and fortunately, this mount worked almost perfectly for the advanced research folding stock. The only difference was in the design of the locking mechanism. On the advanced research there is a small latch that catches on the locking mechanism in the up position. On the maruzen, this latch caught a part of the grip, and was not able to fold out into the open position. So, I removed this latch with a Hack saw, and sanded it smooth. I believe that the Advanced Research stock is a tiny bit narrower than the Maruzen stock intended to be used with the M870, but this worked out to my advantage, as the tight fit acted as a sorf of friction fit locking mechanism in either the up or open position. It takes a great deal of force to open and close the stock. And if the fit becomes loose, it's very easy to tighten the screw holding it all together. Shell holder On top of this stock I placed the 5-shell holder, also made my Advanced Research. 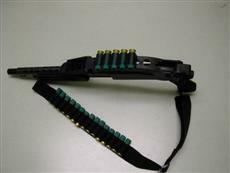 This particular shell holder was designed to be used with the folding stock, and therefor installation was a snap. It just screws right into the mounting holes already on the stock. And I think it adds a touch of class. Heat Shield The second major part of this phase of the project was the heat shield. 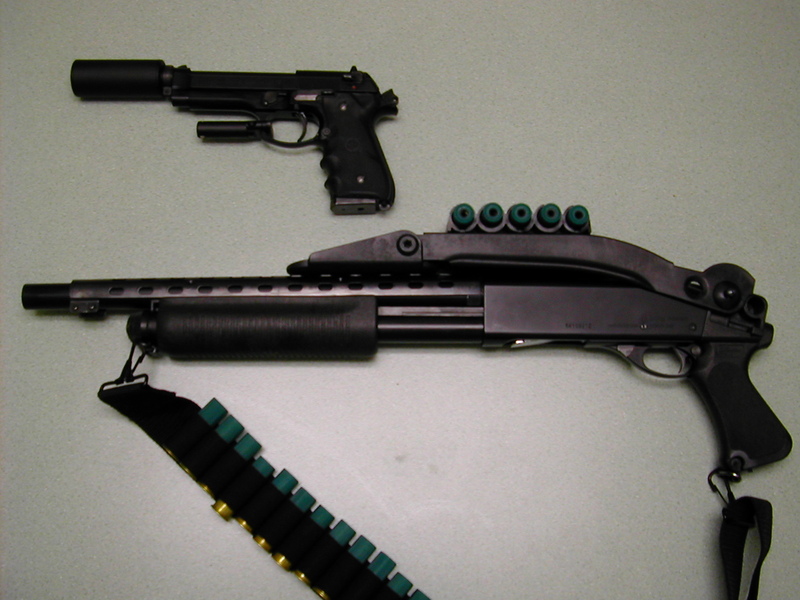 I don't believe that the Maruzen and the real remington M870 have the same dimensions, due to the fact that the heat shield fits a little too snuggly on the barrel. 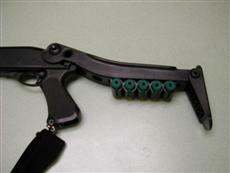 One problem I had was that the fore grip rubs against the bottom of the heat shield. This friction caused the racking action to be a little more difficult, and would sometimes jam up the action all together. The racking action would also cause the heat shied to twist, and uncenter itself on the barrel. To correct this problem, I took a steel grate, and sanded down the bottom of the heat shield. This takes a lot of patience, for the Advanced Research heat shield isn't made out of airsoft grade metal. It's meant for the real thing. 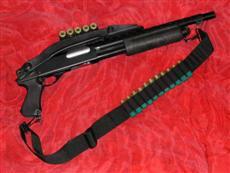 But after a while, the heat shield fits snug against the fore grip, but still making it comfortable to rack. 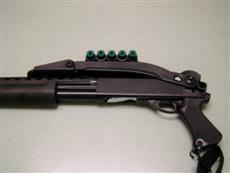 A word of warning about the heat shield... when fitting the heat shield to the gun, it will scratch the finish off of the barrel. This isn't a problem for me, since I intend on leaving the heat shield on all the time. But for those who like a modular customized shotgun approach, be advised that your gun will look like crap up close if you take the heat shield off. 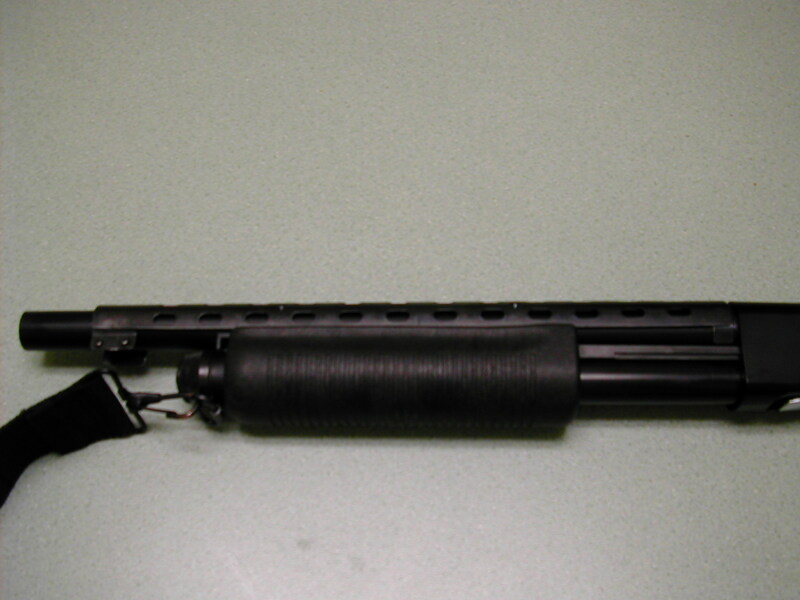 Custom Remington 870 laser mounting - a custom method for fitting a laser unit to the end of the 870, not a method I would recommend though. The original website is from this page here: http://www.angelfire.com/tx/ShotGun/ "The MultiPurpose Shotgun"